It’s not often you can get dinner for just a buck, but you can today (August 23) at the Fontana Pancheros Mexican Grill. 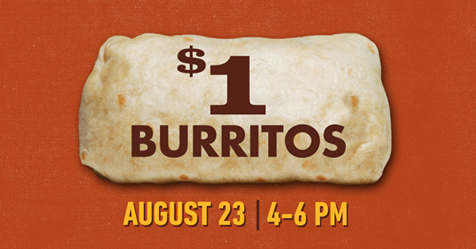 The location is offering burritos for only one dollar from 4 to 6 p.m.
Be sure to say Hi to Bob. The Fontana Pancheros is at 16421 Sierra Lakes Parkway, Suite 300. This entry was posted in Fontana, Mexican and tagged deals by John Plessel. Bookmark the permalink.